Hi everyone, this is Paul! For mini course 10 I continue showing you the easiest way to express the future tense in Spanish and I demonstrate just how powerful one little syllable can be! It’s amazing. In the middle section we look at how to say “it means” with a very common expression in Spanish, useful for everyday conversation. Then finally I give you a sneak peak at how you can add 2000 words to your Spanish vocabulary very quickly by taking advantage of a clever language trick with its roots going all the way back to Latin! Enjoy and see you next time! P.S – My (private) FULL COURSE is now available! 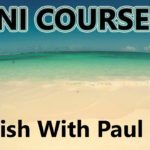 Unlike these short mini-courses, it’ll take you all the way into full conversational fluency in Spanish and you’ll also get 1-1 access to me to help you through it. Simply register to download the course book for this lesson and you’ll get all the details.